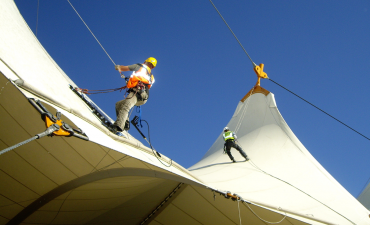 Tensile recommends regular checks of structure, Maintenance & cleaning frequently will depend on different factors such as shape, location and amount of airborne dirt’s. Painting & Tensioning are parts of Tensile Structure Maintenance on semi or annual basis. Our commitment to customer service doesn’t end simply because a project is completed. Emirates Tents offers clients a wealth of post-project resources and assistance. Building owners may contract with our company to ensure their structures look as breathtaking years from now as they did the day the last piece of steel, cable or tensile fabric was put into place. These services can range from simple cleanings to comprehensive structural reviews and modifications. Our site superintendents are on call 24 / 7, allowing Emirates Tents to promptly respond to any service requests.